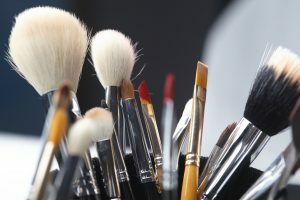 Most women use their cosmetic brushes every day to apply makeup, but how often do those brushes get cleaned? Certainly not as often as they should. According to the majority of dermatologists, you should clean your cosmetic brushes at least once a week. Why? Because cosmetic brushes harbor bacteria that contribute to nasty breakouts and other skin issues. Not only that but cleaning your cosmetic brushes on a regular basis helps to extend the life of bristles and ensures makeup goes on smoother. Below contains everything you need to know about cleaning cosmetic brushes. First off, which soap should I use? 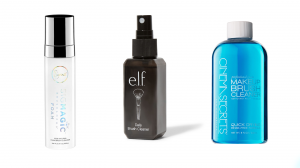 Some makeup artists prefer dish soap, while others prefer baby shampoo. Dish soap removes everything from cosmetic brushes, including tough oils. All you need to do is add a few small drops of dish soap to a cup of warm water and then whisk together. 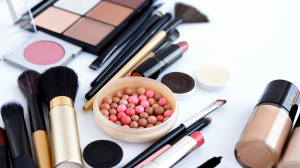 It also works on makeup sponges -- simply allow makeup sponges to sit in a glass containing warm water and dish soap for a few minutes, then rinse with warm water, dab on a paper towel, and then microwave for a few seconds to kill bacteria. You can also purchase specific cosmetic brush cleansers, such as Sigma Beauty Sigmagic Brushampoo, e.l.f. Daily Brush Cleaner, and Cinema Secrets Makeup Brush Cleaner. What's the right way to clean cosmetic brushes? When should I replace my cosmetic brushes? Essentially, once you start to notice your brushes aren't getting as clean as they once did, it's probably time to replace them. You should purchase new brushes every three months to replace older ones. But as long as your brushes aren't shedding, they can last a very long time with proper care. Caring for your cosmetic brushes doesn't have to be difficult. All it requires is the right kind of soap and techniques. Keep your cosmetic brushes clean regularly, and both your skin and brushes will remain in tip-top shape! "How to Clean Your Makeup Brushes (and How Often You Should Do It)," Allure, July 14, 2017. "How to Clean Makeup Brushes the Right Way," Elle, February 8, 2018. "How to Properly Clean Your Makeup Brushes," Good Housekeeping, August 31, 2017.